This article is about the XI, XII and XIII century religious military campaigns in the Middle East. For other uses, see Crusade (disambiguation). The Crusades originally had the goal of recapturing Jerusalem and the Holy Land from Muslim rule and were launched in response to a call from the Christian Byzantine Empire for help against the expansion of the Muslim Seljuk Turks into Anatolia. The term is also used to describe contemporaneous and subsequent campaigns conducted through to the 16th century in territories outside the Levant usually against pagans, heretics, and peoples under the ban of excommunication for a mixture of religious, economic, and political reasons. Rivalries among both Christian and Muslim powers led also to alliances between religious factions against their opponents, such as the Christian alliance with the Sultanate of Rum during the Fifth Crusade. The Holy Land is significant in Christianity because of the land's association as the place of birth, ministry, Crucifixion and Resurrection of Jesus of Nazareth, who Christians regard as the Saviour or Messiah. By the end of the 4th century, following Emperor Constantine's conversion to Christianity (313) and the founding of the Byzantine Empire, the Holy Land had become a predominantly Christian country. Churches commemorating various events in the life of Jesus, had been erected at key sites. The Muslim presence in the Holy Land began with the initial Arab conquest of Palestine in the 7th century. The Muslim armies' successes put increasing pressure on the Eastern Orthodox Byzantine Empire. Another factor that contributed to the change in Western attitudes towards the East came in the year 1009, when the Fatimid Caliph al-Hakim bi-Amr Allah ordered the destruction of the Church of the Holy Sepulchre. In 1039 his successor, after requiring large sums be paid for the right, permitted the Byzantine Empire to rebuild it. Pilgrimages were allowed to the Holy Lands before and after the Sepulchre was rebuilt, but for a time pilgrims were captured and some of the clergy were killed. The Muslim conquerors eventually realized that the wealth of Jerusalem came from the pilgrims; with this realization the persecution of pilgrims stopped. However, the damage was already done, and the violence of the Seljuk Turks became part of the concern that spread the passion for the Crusades. The origins of the Crusades lie in developments in Western Europe earlier in the Middle Ages, as well as the deteriorating situation of the Byzantine Empire in the east caused by a new wave of Turkish Muslim attacks. The breakdown of the Carolingian Empire in the late 9th century, combined with the relative stabilization of local European borders after the Christianization of the Vikings, Slavs, and Magyars, had produced a large class of armed warriors whose energies were misplaced fighting one another and terrorizing the local populace. The Church tried to stem this violence with the Peace and Truce of God movements, which was somewhat successful, but trained warriors always sought an outlet for their skills, and opportunities for territorial expansion were becoming less attractive for large segments of the nobility. One exception was the Reconquista in Spain and Portugal, which at times occupied Iberian knights and some mercenaries from elsewhere in Europe in the fight against the Islamic Moors. The Crusades were, in part, an outlet for an intense religious piety which rose up in the late 11th century among the lay public. A crusader would, after pronouncing a solemn vow, receive a cross from the hands of the pope or his legates, and was thenceforth considered a "soldier of the Church". This was partly because of the Investiture Controversy, which had started around 1075 and was still on-going during the First Crusade. As both sides of the Investiture Controversy tried to marshal public opinion in their favor, people became personally engaged in a dramatic religious controversy. The result was an awakening of intense Christian piety and public interest in religious affairs, and was further strengthened by religious propaganda, which advocated Just War in order to retake the Holy Land from the Muslims. The Holy Land included Jerusalem (where the death, resurrection and ascension into heaven of Jesus took place according to Christian theology) and Antioch (the first Christian city). Further, the remission of sin was a driving factor and provided any God-fearing man who had committed sins with an irresistible way out of eternal damnation in Hell. It was a hotly debated issue throughout the Crusades as what exactly "remission of sin" meant. Most believed that by retaking Jerusalem they would go straight to heaven after death. However, much controversy surrounds exactly what was promised by the popes of the time. One theory was that one had to die fighting for Jerusalem for the remission to apply, which would hew more closely to what Pope Urban II said in his speeches. This meant that if the crusaders were successful, and retook Jerusalem, the survivors would not be given remission. Another theory was that if one reached Jerusalem, one would be relieved of the sins one had committed before the Crusade. Therefore, one could still be sentenced to Hell for sins committed afterwards. All of these factors were manifested in the overwhelming popular support for the First Crusade and the religious vitality of the 12th century. 15th century painting of Pope Urban II at the Council of Clermont, where he preached an impassioned sermon to take back the Holy Land. The immediate cause of the First Crusade was the Byzantine emperor Alexios I's appeal to Pope Urban II for mercenaries to help him resist Muslim advances into territory of the Byzantine Empire. In 1071, at the Battle of Manzikert, the Byzantine Empire was defeated, which led to the loss of all of Asia Minor (modern Turkey) save the coastlands. Although attempts at reconciliation after the East-West Schism between the Catholic Western Church and the Eastern Orthodox Church had failed, Alexius I hoped for a positive response from Urban II and got it, although it turned out to be more expansive and less helpful than he had expected. When the First Crusade was preached in 1095, the Christian princes of northern Iberia had been fighting their way out of the mountains of Galicia and Asturias, the Basque Country and Navarre, with increasing success, for about a hundred years. The fall of Moorish Toledo to the Kingdom of León in 1085 was a major victory, but the turning points of the Reconquista still lay in the future. The disunity of Muslim emirs was an essential factor. While the Reconquista was the most prominent example of European reactions against Muslim conquests, it is not the only such example. The Norman adventurer Robert Guiscard had conquered Calabria in 1057 and was holding what had traditionally been Byzantine territory against the Muslims of Sicily. The maritime states of Pisa, Genoa and Catalonia were all actively fighting Islamic strongholds in Majorca and Sardinia, freeing the coasts of Italy and Catalonia from Muslim raids. Much earlier, the Christian homelands of Syria, Lebanon, Palestine, Egypt, and so on had been conquered by Muslim armies. This long history of losing territories to a religious enemy created a powerful motive to respond to Byzantine Emperor Alexius I's call for holy war to defend Christendom, and to recapture the lost lands starting with Jerusalem. In the Byzantine homelands, the Eastern Emperor's weakness was revealed by the disastrous defeat at the Battle of Manzikert in 1071, which reduced the Empire's Asian territory to a region in western Anatolia and around Constantinople. A sure sign of Byzantine desperation was the appeal of Alexios I to his enemy, the Pope, for aid. But Gregory was occupied with the Investiture Controversy and could not call on the German emperor, so a crusade never took shape. For Gregory's more moderate successor, Pope Urban II, a crusade would serve to reunite Christendom, bolster the Papacy, and perhaps bring the East under his control. The disaffected Germans and the Normans were not to be counted on, but the heart and backbone of a crusade could be found in Urban's own homeland among the northern French. In the 13th century, Crusades never expressed such a popular fever, and after Acre fell for the last time in 1291 and the Occitan Cathars were exterminated during the Albigensian Crusade, the crusading ideal became devalued by Papal justifications of political and territorial aggressions within Catholic Europe. The last crusading order of knights to hold territory were the Knights Hospitaller. After the final fall of Acre, they took control of the island of Rhodes, and in the sixteenth century, were driven to Malta, before being finally unseated by Napoleon Bonaparte in 1798. A traditional numbering scheme for the crusades totals nine during the 11th to 13th centuries. This division is arbitrary and excludes many important expeditions, among them those of the 14th, 15th, and 16th centuries. In reality, the crusades continued until the end of the 17th century, the crusade of Lepanto occurring in 1571, that of Hungary in 1664, and the crusade to Candia in 1669. The Knights Hospitaller continued to crusade in the Mediterranean Sea around Malta until their defeat by Napoleon in 1798. There were frequent "minor" Crusades throughout this period, not only in Palestine but also in the Iberian Peninsula and central Europe, against Muslims and also Christian heretics and personal enemies of the Papacy or other powerful monarchs. Following abortive popular crusades in early 1096, the official crusader armies set off from France and Italy on the papally-ordained date of 15 August 1096. The armies journeyed eastward by land toward Constantinople, where they received a wary welcome from the Byzantine Emperor. Pledging to restore lost territories to the empire, the Crusaders were supplied and transported to Anatolia where they laid siege to Seljuk-occupied Nicaea. The city fell on 19 June 1097. The Crusader armies fought further battles against the Turks, facing grave deprivation of both food and water in their summer crossing of Anatolia. The lengthy Siege of Antioch began in October 1097 and endured until June 1098. The ruler of Antioch was not sure how the Christians living within his city would react, so he forced them to live outside the citadel. The siege only ended when one of the gates to the city was betrayed by an Armenian dissident. Once inside the city, as was standard military practice at the time, the Crusaders massacred the Muslim inhabitants, destroyed mosques and pillaged the city. Local Christians assassinated Yaghisiyan, former ruler of the city. However a large Muslim relief army under Kerbogha immediately besieged the victorious Crusaders within Antioch. Bohemund of Taranto led a successful break-out and defeat of Kerbogha's army on the 28th of June. The starving crusader army marched south, moving from town to town along the coast, finally reaching the walls of Jerusalem on 7 June 1099 with only a fraction of their original forces. The Jews and Muslims fought together to defend Jerusalem against the invading Franks. They were unsuccessful though and on 15 July 1099 the crusaders entered the city. They proceeded to massacre the remaining Jewish and Muslim civilians and pillaged or destroyed mosques and the city itself. One historian has written that the "isolation, alienation and fear"[page needed] felt by the Franks so far from home helps to explain the atrocities they committed, including the cannibalism which was recorded after the Siege of Maarat in 1098. As a result of the First Crusade, several small Crusader states were created, notably the Kingdom of Jerusalem. In the Kingdom of Jerusalem at most 120,000 Franks (predominantly French-speaking Western Christians) ruled over 350,000 Muslims, Jews, and native Eastern Christians. After gaining control of Jerusalem the Crusaders created four Crusader states: the kingdom of Jerusalem, the County of Edessa, the Principality of Antioch and the County of Tripoli. Initially, Muslims did very little about the Crusader states due to internal conflicts. Eventually, the Muslims began to reunite under the leadership of Imad al-Din Zangi. He began by re-taking Edessa in 1144. It was the first city to fall to the Crusaders, and became the first to be recaptured by the Muslims. This led the Pope to call for a second Crusade. Following this crusade there was a second, less successful wave of crusaders, in which Turks led by Kilij Arslan defeated the Crusaders in three separate battles in a well-managed response to the First Crusade. This is known as the Crusade of 1101 and may be considered an adjunct of the First Crusade. After a period of relative peace in which Christians and Muslims co-existed in the Holy Land, Muslims conquered the town of Edessa. A new crusade was called for by various preachers, most notably by Bernard of Clairvaux. 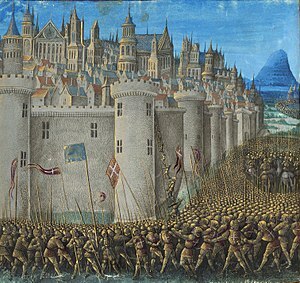 French and South German armies, under the Kings Louis VII and Conrad III respectively, marched to Jerusalem in 1147 but failed to win any major victories, launching a failed pre-emptive siege of Damascus, an independent city that would soon fall into the hands of Nur ad-Din, the main enemy of the Crusaders. On the other side of the Mediterranean, however, the Second Crusade met with great success as a group of Northern European Crusaders stopped in Portugal, allied with the Portuguese King, Afonso I of Portugal, and retook Lisbon from the Muslims in 1147. A detachment from this group of crusaders helped Count Raymond Berenguer IV of Barcelona conquer the city of Tortosa the following year. In the Holy Land by 1150, both the kings of France and Germany had returned to their countries without any result. St. Bernard of Clairvaux, who in his preachings had encouraged the Second Crusade, was upset with the amount of misdirected violence and slaughter of the Jewish population of the Rhineland. North Germans and Danes attacked the Wends during the 1147 Wendish Crusade, which was unsuccessful as well. In 1187, Saladin, Sultan of Egypt, conquered Jerusalem after nearly a century under Christian rule, following the Battle of Hattin. After the Christians surrendered the city, Saladin spared the civilians and for the most part left churches and shrines untouched to be able to collect ransom money from the Franks. Several thousand apparently were not redeemed and probably were sold into slavery. Saladin is remembered respectfully in both European and Islamic sources as a man who "always stuck to his promise and was loyal." The reports of Saladin's victories shocked Europe. Pope Gregory VIII called for a crusade, which was led by several of Europe's most important leaders: Philip II of France, Richard I of England (aka Richard the Lionheart), and Frederick I, Holy Roman Emperor. Frederick drowned in Cilicia in 1190, leaving an unstable alliance between the English and the French. Before his arrival in the Holy Land, Richard captured the island of Cyprus from the Byzantines in 1191. Cyprus would serve as a Crusader base for centuries to come, and would remain in Western European hands until the Ottoman Empire conquered the island from Venice in 1571. After a long siege, Richard the Lionheart recaptured the city of Acre and took the entire Muslim garrison under captivity, which was executed after a series of failed negotiations. Philip left, in 1191, after the Crusaders had recaptured Acre from the Muslims. 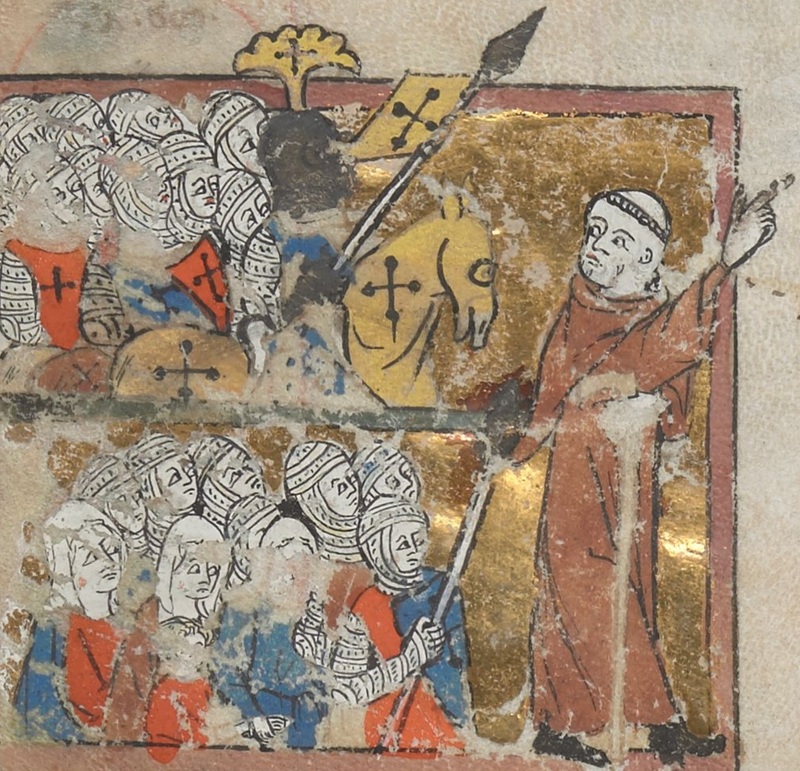 The Crusader army headed south along the coast of the Mediterranean Sea. They defeated the Muslims near Arsuf, recaptured the port city of Jaffa, and were in sight of Jerusalem. However, Richard did not believe he would be able to hold Jerusalem once it was captured, as the majority of Crusaders would then return to Europe, and the crusade ended without the taking of Jerusalem. Richard left the following year after negotiating a treaty with Saladin. The treaty allowed unarmed Christian pilgrims to make pilgrimages to the Holy Land (Jerusalem), while it remained under Muslim control. On Richard's way home, his ship was wrecked and he ended up in Austria, where his enemy, Duke Leopold, captured him. The Duke delivered Richard to the Emperor Henry VI, who held the King for ransom. By 1197, Henry felt ready for a crusade, but he died in the same year of malaria. Richard I died during fighting in Europe and never returned to the Holy Land. The Third Crusade is sometimes referred to as the Kings' Crusade. The Fourth Crusade was initiated in 1202 by Pope Innocent III, with the intention of invading the Holy Land through Egypt. Because the Crusaders lacked the funds to pay for the fleet and provisions that they had contracted from the Venetians, Doge Enrico Dandolo enlisted the crusaders to restore the Christian city of Zara (Zadar) to obedience. 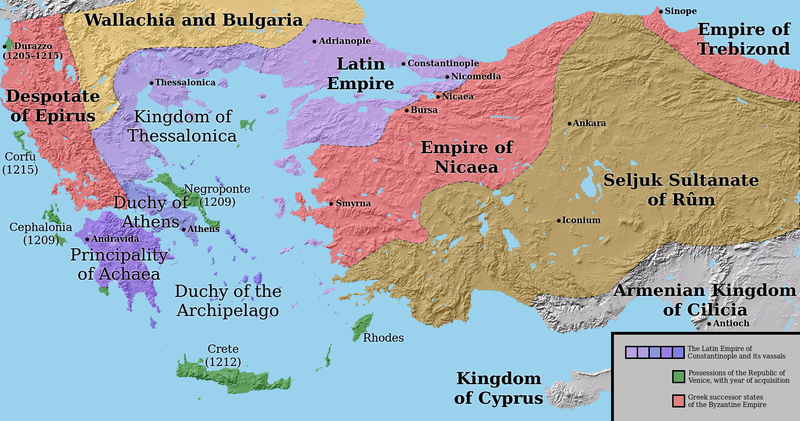 Because they subsequently lacked provisions and time on their vessel lease, the leaders decided to go to Constantinople, where they attempted to place a Byzantine exile on the throne. After a series of misunderstandings and outbreaks of violence, the Crusaders sacked the city in 1204, and established the so-called Latin Empire and a series of other Crusader states throughout the territories of the Greek Byzantine Empire. This is often seen as the final breaking point of the Great Schism between the Eastern Orthodox Church and (Western) Roman Catholic Church. By processions, prayers, and preaching, the Church attempted to set another crusade afoot, and the Fourth Council of the Lateran (1215) formulated a plan for the recovery of the Holy Land. In the first phase, a crusading force from Austria and Hungary joined the forces of the king of Jerusalem and the prince of Antioch to take back Jerusalem. In the second phase, crusader forces achieved a remarkable feat in the capture of Damietta in Egypt in 1219, but under the urgent insistence of the papal legate, Pelagius, they then launched a foolhardy attack on Cairo in July 1221. The crusaders were turned back after their dwindling supplies led to a forced retreat. A night-time attack by the ruler of Egypt, the powerful Ayubid Sultan Al-Kamil, resulted in a great number of crusader losses and eventually in the surrender of the army. Al-Kamil agreed to an eight-year peace agreement with Europe. Al-Kamil had put a bounty of a Byzantine gold piece for every Christian head brought to him during the war. During 1219, St. Francis of Assisi crossed the battle lines at Damietta in order to speak with Al-Kamil. He and his companion Illuminatus were captured and beaten and brought before the Sultan. St. Bonaventure, in his Major Life of St. Francis, says that the Sultan was impressed by Francis and spent some time with him. Francis was given safe passage and although he was offered many gifts, all he accepted was a horn for calling the faithful to prayer. This act eventually led to the establishment of the Franciscan Custody of the Holy Land. In 1229 after failing to conquer Egypt, Frederick II of the Holy Roman Empire, made a peace treaty with Al-Kamil, the ruler of Egypt. This treaty allowed Christians to rule over most of Jerusalem, while the Muslims were given control of the Dome of the Rock and the Al-Aksa mosque. The peace brought about by this treaty lasted for about ten years. Many of the Muslims though were not happy with Al-Kamil for giving up control of Jerusalem and in 1244, following a siege, the Muslims regained control of the city. The eighth Crusade was organized by Louis IX in 1270, again sailing from Aigues-Mortes, initially to come to the aid of the remnants of the crusader states in Syria. However, the crusade was diverted to Tunis, where Louis spent only two months before dying. For his efforts, Louis was later canonised. The Eighth Crusade is sometimes counted as the Seventh, if the Fifth and Sixth Crusades are counted as a single crusade. The Ninth Crusade is sometimes also counted as part of the Eighth. The future Edward I of England undertook another expedition against Baibars in 1271, after having accompanied Louis on the Eighth Crusade. Louis died in Tunisia. The Ninth Crusade was deemed a failure and ended the Crusades in the Middle East. In their later years, faced with the threat of the Egyptian Mamluks, the Crusaders' hopes rested with a Franco-Mongol alliance. The Ilkhanate's Mongols were thought to be sympathetic to Christianity, and the Frankish princes were most effective in gathering their help, engineering their invasions of the Middle East on several occasions. Although the Mongols successfully attacked as far south as Damascus on these campaigns, the ability to effectively coordinate with Crusades from the west was repeatedly frustrated most notably at the Battle of Ain Jalut in 1260. The Mamluks, led by Baibars, eventually made good their pledge to cleanse the entire Middle East of the Franks. With the fall of Antioch (1268), Tripoli (1289), and Acre (1291), those Christians unable to leave the cities were massacred or enslaved and the last traces of Christian rule in the Levant disappeared. The island of Ruad, three kilometers from the Syrian shore, was occupied for several years by the Knights Templar but was ultimately lost to the Mamluks in the Siege of Ruad on September 26, 1302. The Armenian Kingdom of Cilicia, which was not itself a crusader state, and was not Latin Christian, but was closely associated with the crusader states and was ruled by the Latin Christian Lusignan dynasty for its last 34 years, survived until 1375. Other echoes of the crusader states survived for longer, but well away from the Holy Land itself. The Knights of St John carved out a new territory based on the Aegean island of Rhodes, which they ruled until 1522. Cyprus remained under the rule of the House of Lusignan until 1474/89 (the precise date depends on how Venice's highly unusual takeover is interpreted - see Caterina Cornaro) and subsequently that of Venice until 1570. By this time the Knights of St John had moved to Malta - even further from the Holy Land - which they ruled until 1798. In 1198 German Crusaders started Livonian Crusade. Despite numerous setbacks and rebellions, by 1290 Livonians, Latgalians, Selonians, Estonians (including Oeselians), Curonians and Semigallians had been all gradually subjugated. Denmark and Sweden also participated in fight against Estonians. In 1259 Mongols led by Burundai and Nogai Khan ravaged the principality of Halych-Volynia, Lithuania and Poland. After that Pope Alexander IV tried without success to create a crusade against the Blue Horde (see Mongol invasion of Poland). In the 14th century, Khan Tokhtamysh combined the Blue and White Hordes forming the Golden Horde. It seemed that the power of the Golden Horde had begun to rise, but in 1389, Tokhtamysh made the disastrous decision of waging war on his former master, the great Tamerlane. Tamerlane's hordes rampaged through southern Russia, crippling the Golden Horde's economy and practically wiping out its defenses in those lands. After losing the war, Tokhtamysh was then dethroned by the party of Khan Temur Kutlugh and Emir Edigu, supported by Tamerlane. When Tokhtamysh asked Vytautas the Great for assistance in retaking the Horde, the latter readily gathered a huge army which included Lithuanians, Ruthenians, Russians, Mongols, Moldavians, Poles, Romanians and Teutonic Knights. In 1398, the huge army moved from Moldavia and conquered the southern steppe all the way to the Dnieper River and northern Crimea. Inspired by their great successes, Vytautas declared a 'Crusade against the Tatars' with Papal backing. Thus, in 1399, the army of Vytautas once again moved on the Horde. His army met the Horde's at the Vorskla River, slightly inside Lithuanian territory. Although the Lithuanian army was well equipped with cannon, it could not resist a rear attack from Edigu's reserve units. Vytautas hardly escaped alive. Many princes of his kin—possibly as many as 20—were killed (for example, Stefan Musat, Prince of Moldavia and two of his brothers, while a fourth was badly injured ), and the victorious Tatars besieged Kiev. "And the Christian blood flowed like water, up to the Kievan walls," as one chronicler put it. Meanwhile, Temur Kutlugh died from the wounds received in the battle, and Tokhtamysh was killed by one of his own men. The Hussite Crusade(s), also known as the "Hussite Wars," or the "Bohemian Wars," involved the military actions against and amongst the followers of Jan Hus in Bohemia in the period 1420 to circa 1434. The Hussite Wars were arguably the first European war in which hand-held gunpowder weapons such as muskets made a decisive contribution. The Taborite faction of the Hussite warriors were basically infantry, and their many defeats of larger armies with heavily armoured knights helped affect the infantry revolution. In the end, it was an inconclusive war. The Swedish conquest of Finland in the Middle Ages has traditionally been divided into three "crusades": the First Swedish Crusade around 1155 AD, the Second Swedish Crusade about 1249 AD and the Third Swedish Crusade in 1293 AD. The First Swedish Crusade is purely legendary, and according to most historians today, never took place as described in the legend and did not result in any ties between Finland and Sweden. For the most part, it was made up in the late 13th century to date the Swedish rule in Finland further back in time. No historical record has also survived describing the second one, but it probably did take place and ended up in the concrete conquest of southwestern Finland. The third one was against Novgorod, and is properly documented by both parties of the conflict. According to archaeological finds, Finland was largely Christian already before the said crusades. Thus the "crusades" can rather be seen as ordinary expeditions of conquest whose main target was territorial gain. The expeditions were dubbed as actual crusades only in the 19th century by the national-romanticist Swedish and Finnish historians. "High ideals were besmirched by cruelty and greed … the Holy War was nothing more than a long act of intolerance in the name of God". Western and Eastern historiography present variously different views on the crusades, in large part because "crusade" invokes dramatically opposed sets of associations—"crusade" as a valiant struggle for a supreme cause, and "crusade" as a byword for barbarism and aggression. Although Europe had been exposed to Islamic culture for centuries through contacts in Iberian Peninsula and Sicily, much knowledge in areas such as science, medicine, and architecture was transferred from the Islamic to the western world during the crusade era. The military experiences of the crusades also had a limited degree of influence on European castle design; for example, Caernarfon Castle, in Wales, begun in 1283, directly reflects the style of fortresses Edward I had observed while fighting in the Crusades. The invasions of German crusaders prevented formation of the large Lithuanian state incorporating all Baltic nations and tribes. Lithuania was destined to become a small country and forced to expand to the East looking for resources to combat the crusaders. The Northern Crusades caused great loss of life among the pagan Polabian Slavs, and they consequently offered little opposition to German colonization (known as Ostsiedlung) of the Elbe-Oder region and were gradually assimilated by the Germans, with the exception of Sorbs. The First Crusade ignited a long tradition of organized violence against Jews in European culture. The need to raise, transport and supply large armies led to a flourishing of trade throughout Europe. Roads largely unused since the days of Rome saw significant increases in traffic as local merchants began to expand their horizons. This was not only because the Crusades prepared Europe for travel, but also because many wanted to travel after being reacquainted with the products of the Middle East. This also aided in the beginning of the Renaissance in Italy, as various Italian city-states from the very beginning had important and profitable trading colonies in the crusader states, both in the Holy Land and later in captured Byzantine territory. From a larger perspective, and certainly from that of noted naval/maritime historian Archibald Lewis, the Crusades must be viewed as part of a massive macrohistorical event during which Western Europe, primarily by its ability in naval warfare, amphibious siege, and maritime trade, was able to advance in all spheres of civilization. Recovering from the Dark Ages of AD 700-1000, throughout the 11th century Western Europe began to push the boundaries of its civilization. Prior to the First Crusade the Italian city-state of Venice, along with the Byzantine Empire, had cleared the Adriatic Sea of Islamic pirates, and loosened the Islamic hold on the Mediterranean Sea (Byzantine-Muslim War of 1030-1035). The Normans, with the assistance of the Italian city-states of Genoa and Pisa, had retaken Sicily from the Muslims from 1061-1091. These conflicts prior to the First Crusade had both retaken Western European territory and weakened the Islamic hold on the Mediterranean, allowing for the rise of Western European Mediterranean trading and naval powers such as the Sicilian Normans and the Italian city-states of Venice, Genoa, and Pisa. During the Middle Ages, the key trading region of Western Europe was the Black Sea-Mediterranean Sea-Red Sea. It was the aforementioned pre-First Crusade actions, along with the Crusades themselves, which allowed Western Europe to contest the trade of the Mediterranean Sea and Black Sea, for a period which began in the 1000s and would only be ended by the Turkish Ottoman Empire beginning in the mid-to-late 1400s. This Western European contestation of vital sea lanes allowed the economy of Western Europe to advance to previously unknown degrees, most obviously as regards the Maritime Republics of Venice, Genoa, and Pisa. Indeed, it is no coincidence that the Renaissance began in Italy, as the Maritime Republics, through their control of the Eastern Mediterranean and Black Seas, were able to return to Italy the ancient knowledge of the Greeks and Romans, as well as the products of distant East Asia. Combined with the Mongol Empire, Western Europe traded extensively with East Asia, the security of the Mongol Empire allowing the products of Asia to be brought to such Western European controlled ports as Acre, Antioch, Kaffa (on the Black Sea) and even, for a time, Constantinople itself. The Fifth Crusade of 1217-1221 and the Seventh Crusade of 1248-1254 were largely attempts to secure Western European control of the Red Sea trade region, as both Crusades were directed against Egypt, the power base of the Ayyubid, and then Mameluke, Sultanates. It was only in the 1300s, as the stability of trade with Asia collapsed with the Mongol Empire, the Mamelukes destroyed the Middle Eastern Crusader States, and the rising Ottoman Empire impeded further Western European trade with Asia, that Western Europeans sought alternate trade routes to Asia, ultimately leading to Columbus's voyage of 1492. In the Caucasus Mountains of Georgia, in the remote highland region of Khevsureti, a tribe called the Khevsurs are thought to possibly be direct descendants of a party of crusaders who got separated from a larger army and have remained in isolation with some of the crusader culture intact. Into the 20th century, relics of armor, weaponry and chain mail were still being used and passed down in such communities. Russian serviceman and ethnographer Arnold Zisserman who spent 25 years (1842–67) in the Caucasus, believed the exotic group of Georgian highlanders were descendants of the last Crusaders based on their customs, language, art and other evidence. American traveler Richard Halliburton saw and recorded the customs of the tribe in 1935. For other uses of crusade, see Crusade (disambiguation). The crusades were never referred to as such by their participants. The original crusaders were known by various terms, including fideles Sancti Petri (the faithful of Saint Peter) or milites Christi (knights of Christ). They saw themselves as undertaking an iter, a journey, or a peregrinatio, a pilgrimage, though pilgrims were usually forbidden from carrying arms. Like pilgrims, each crusader swore a vow (a votus), to be fulfilled on successfully reaching Jerusalem, and they were granted a cloth cross (crux) to be sewn into their clothes. This "taking of the cross", the crux, eventually became associated with the entire journey; the word "crusade" (coming into English from the Medieval French croisade and Spanish cruzada) developed from this. ↑ 1.0 1.1 1.2 Riley-Smith, Jonathan. The Oxford History of the Crusades New York: Oxford University Press, 1999. ISBN 0192853643. ↑ Riley-Smith, Jonathan. The First Crusaders, 1095-1131 Cambridge University Press, 1998. ISBN 0521646030. ↑ 4.0 4.1 4.2 Crusades in The New Catholic Encyclopedia, New York: McGraw-Hill Book Company, 1966, Vol. IV, p. 508. ↑ e.g. the Albigensian Crusade, the Aragonese Crusade, the Reconquista, and the Northern Crusades. ↑ Halsall, Paul (December 1997). "Philip de Novare: Les Gestes des Ciprois, The Crusade of Frederick II, 1228-29". Medieval Sourcebook. Fordham University. http://www.fordham.edu/halsall/source/1228frederick2.html. Retrieved 2008-02-08. —"Gregory IX had in fact excommunicated Frederick before he left Sicily the second time"
↑ Shaye I.D. Cohen. "Legitimization Under Constantine". PBS. http://www.pbs.org/wgbh/pages/frontline/shows/religion/why/legitimization.html. Retrieved 2007-08-11. "Crusades" in the 1913 Catholic Encyclopedia. ↑ Tuchman, Barbara. A Distant Mirror: The Calamitous 14th Century. Alfred A. Knopf; Reissue edition. (August 1978) 279. ISBN 0394400267. ↑ 20.0 20.1 Arab Historians of the Crusades, trans. F. Gabrieli, trans. E. J. Costello. London: Routledge and Kegan Paul, 1984. ↑ 22.0 22.1 Trumpbour, John. “Crusades.” In The Oxford Encyclopedia of the Islamic World. , edited by John L. Esposito. Oxford Islamic Studies Online, http://www.oxfordislamicstudies.com/article (accessed Feb 17, 2008). ↑ 26.0 26.1 “Crusades” In The Islamic World: past and Present. , edited by John L. Esposito. Oxford Islamic Studies Online, http://www.oxfordislamicstudies.com/article (accessed Feb 17, 2008). ↑ 28.00 28.01 28.02 28.03 28.04 28.05 28.06 28.07 28.08 28.09 28.10 28.11 28.12 28.13 28.14 28.15 28.16 28.17 Lewis, Archibald (January 1988). Nomads and Crusaders: AD 1000-1368.. Indiana University Press. ISBN 9780253206527. ↑ Bahā' ad-Dīn ibn Shaddād (2002). The Rare and Excellent History of Saladin. Richards, D.S. (trans.). Ashgate. ISBN 978-0-7546-3381-6. ↑ "The era of the Second and Third Crusades » The Crusader states to 1187". Encyclopaedia Britannica. ↑ Lamb, Harold. The Crusades: The Flame of Islam, Double Day and Company, Inc. New York. 1931 pg. 310-311. ↑ 38.0 38.1 Riley-Smith, Jonathan. The Atlas of the Crusades New York: Facts on File, 1990. ISBN 0-8160-2186-4. ↑ Wend (people). Britannica Online Encyclopedia. ↑ Crusades (Christian Warfare with Islam in Palestine). Jewishvirtuallibrary.org. ↑ Images from the Georgia–Chechnya Border, 1970–1980, Phoebe A. Hearst Museum of Anthropology.